Instructor User Guide AssignmentsHow do I grade a peer review assignment? 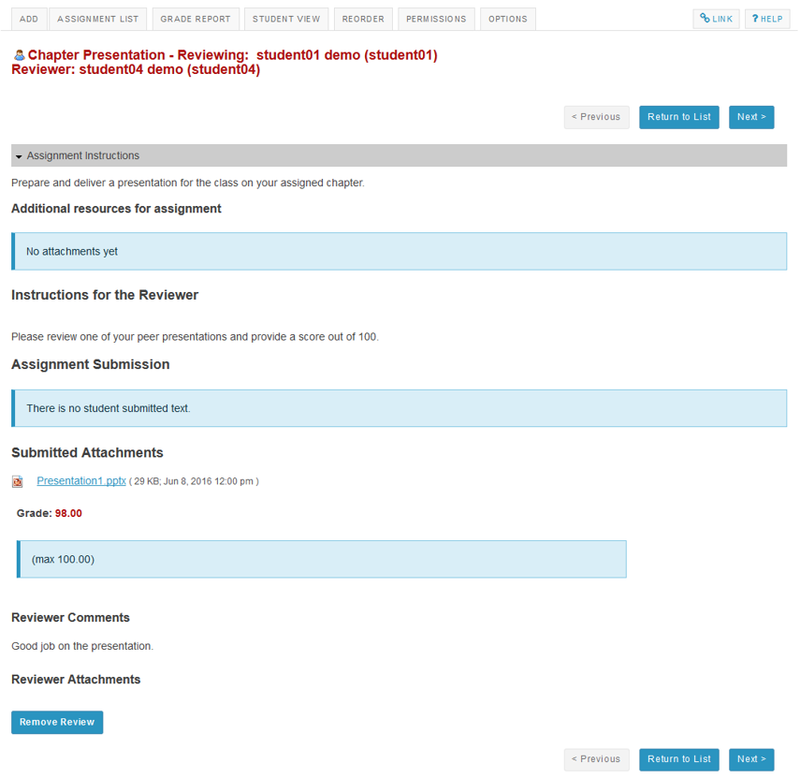 Select the peer review assignment to grade. 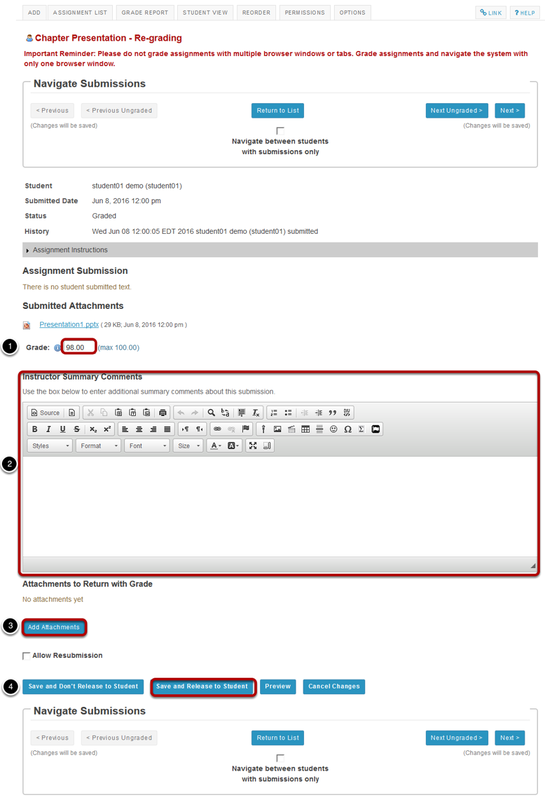 Zoom: Select the peer review assignment to grade. 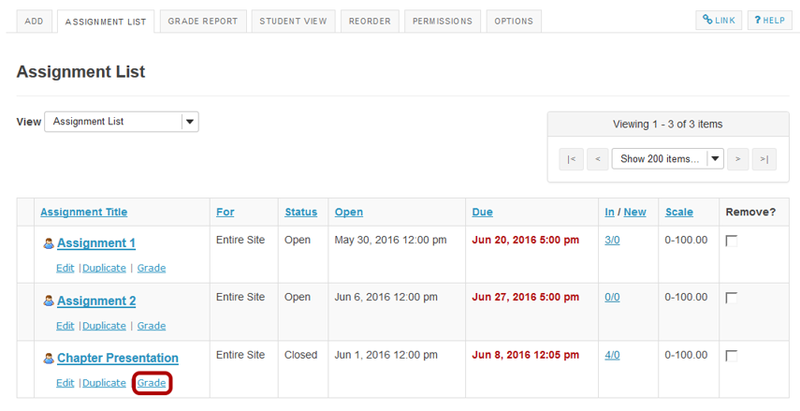 View overall peer assessment scores. 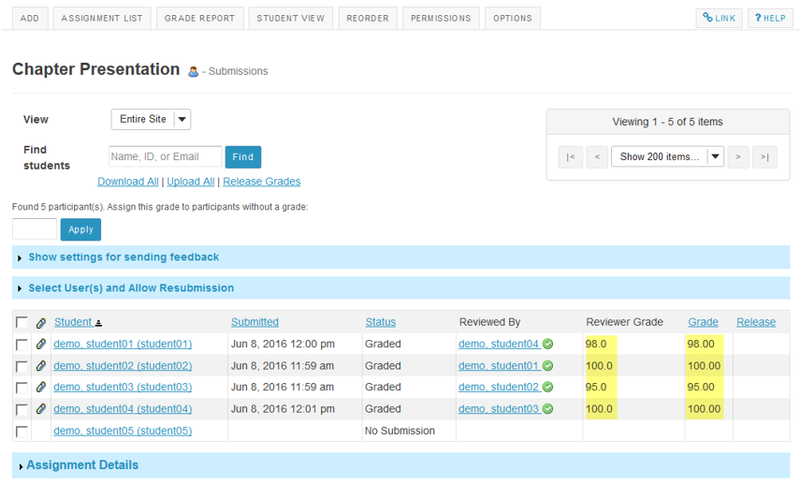 Zoom: View overall peer assessment scores. The scores provided by peer reviewers will be shown on this page. If more than one review was assigned for each student, the reviewer grade will be an average of all the reviewer scores submitted. By default, the grade for the assignment is set to the reviewer grade. You may override this grade if you choose. Click on the reviewer name to view individual peer review feedback. Zoom: Click on the reviewer name to view individual peer review feedback. Individual reviewer feedback will display. Zoom: Individual reviewer feedback will display. This is the feedback as entered by the reviewer. Students will be able to see this peer feedback once the grade has been released for the assignment. If a reviewer has provided incorrect or inappropriate feedback, you may click on Remove Review to delete the peer feedback and score. 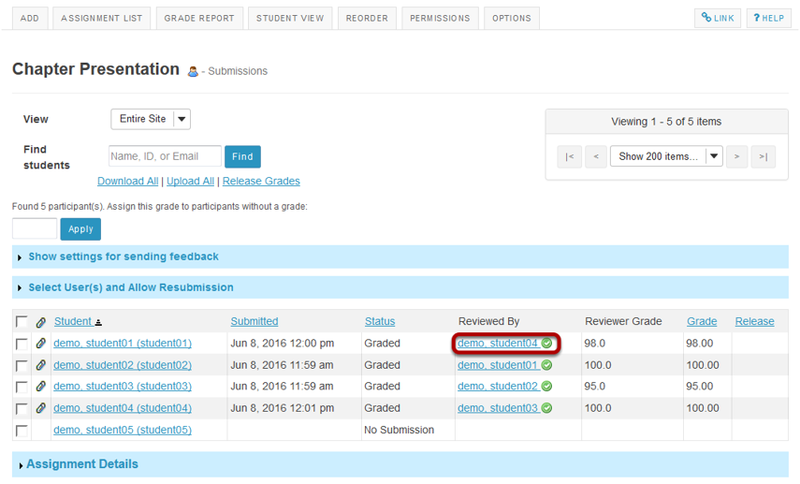 If you want to make the peer review scores the official grade, you may simply select Release Grades and the reviewer scores will be sent to the gradebook. 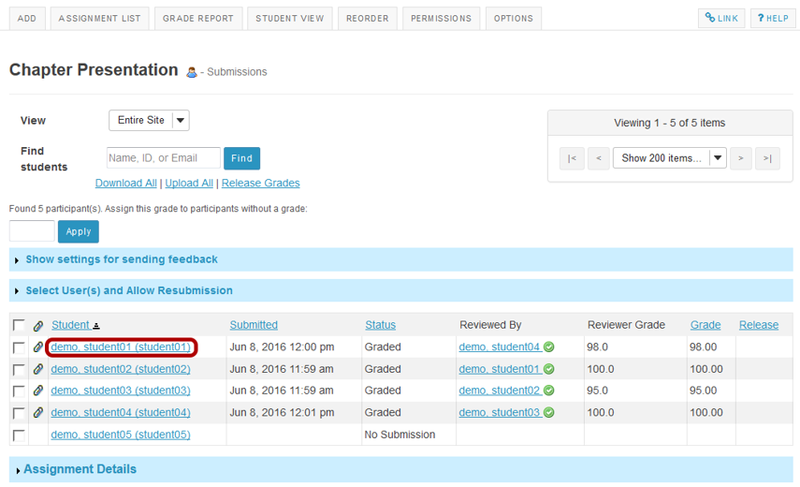 Or, select a student to enter a score adjustment or instructor comments. Zoom: Or, select a student to enter a score adjustment or instructor comments. 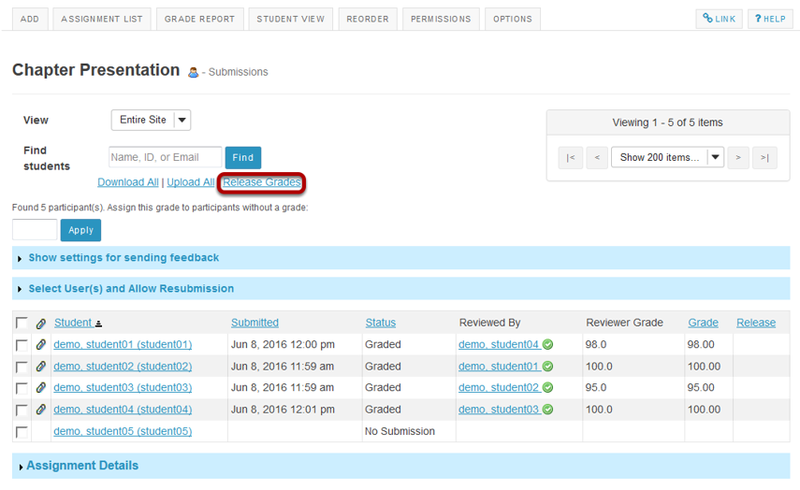 Click on a student name to go to the detailed view of the student submission. Adjust score or enter comments. Zoom: Adjust score or enter comments. Enter a score adjustment in the Grade field. Add instructor comments using the Rich Text Editor. Attach a file with additional feedback. Save and Release to Student to send the score to the gradebook. Next: How do I download assignments for grading offline?